Punctuated equilibrium is a term that refers to the evolutionary changes of plants and animals in a relatively static way. In contrast to the concept that life forms change slowly over time in response to their environment, punctuated equilibrium is a theory that those changes occur in spurts of time periodically. This theory stands in contrast to Darwin's more dynamic model of evolution. Punctuated equilibrium states that evolution only takes place in bursts of time that are rapid. However, the term "rapid," in evolutionary terms should be understood to mean approximately 500,000 years in some circumstances. Prior to the change which is often caused by an environmental factor, the life form's species or class lives in "stasis" or an unchanged state for many, many years because it does not have a need for change. Once the change happens, quite quickly, the species re-enters stasis with its new evolutionary adaptation. A species of sea animals lives, breeds, and dies for thousands of years. Suddenly, the sea level changes and the animals must adapt. Their bodies develop in order to accommodate the environmental change, and from then on are evolutionarily different from their ancestors. A species of birds exists in stasis for many thousands of years. Suddenly, a bacteria causes their primary tree of sheltering choice to die. The birds must adapt within the environment to trees that are much higher requiring more wing strength. Some birds die. The remaining birds' bodies adapt as necessary and they return to a state of stasis. A species of worms lives in the soil in a particular climate and is in a state of stasis. Climate changes cause the pH of the soil to change. The change in pH causes some worms to die, but those that survive adapt and reproduce with new ability to withstand the pH change in the soil. The species returns to stasis. Some argue that the evolution of monkey into man is actually a form of punctuated equilibrium as there are periods of no change (in stasis) and periods of what appears to be rapid and pronounced change. The specific species Globoratalia crassaformis is a microfossil that shows punctuated equilibrium that took upwards of half of a million years to transition into G. tosaensis and eventually G. truncatulinoides. Both species still exist. 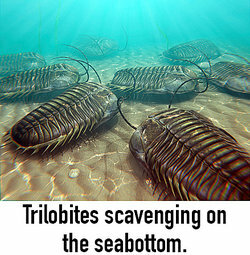 In New Hampshire there is a quarry in which the pattern of punctuated equilibrium has been noted in Trilobites. The fossils suggest a quick appearance of change between one an older and more recent class called Phacops. Fossils of Brachiopods show a "sudden transition" between the species Kutchithyris acutiplicata and K. euryptcha that seem to only be explained by a sudden need for evolutionary change. A variety of dinosaurs including Stegoceras, Tyrannosauras, Syracosaurs, and Lambeosaurus all show signs of punctuated equilibrium that aligns with environmental changes such as sea level change that might have caused a need for evolutionary adaptation. So now you have seen examples and can better understand how punctuated equilibrium works. "Punctuated Equilibrium Examples." YourDictionary, n.d. Web. 19 April 2019. <https://examples.yourdictionary.com/punctuated-equilibrium-examples.html>. How Did Charles Darwin Die?